Get the best service and rates by dealing direct with Billy Tea Safaris. Your Eco friendly guide will meet you at your accommodation and after introductions, we drive north along the scenic coastal road past all the northern beaches, Port Douglas, Mossman through Lush farmland contrasts with seascape as we approach the majestic Daintree River. Time for a short morning tea break then its 'all aboard' for an informative river cruise on the Magestic Daintree River. Relax and enjoy the splendour only the Daintree can offer as you learn of Estuarine Crocodiles, mangrove forests and wildlife, this is nature at its best! This is where World Heritage Rainforest meets the Ocean. This is a diverse Eco System. We have a family package rate which will save a family $115.00.Family Package $695.00 (2adults + 2 children age 0-14yrs)Tour does not run Christmas Day. Billy Tea Safaris is a small locally owned Advanced Eco Accredited Tour Operator, which operates small personalised tours with custom built 4WD vehicles, maximum 16 passengers per vehicle, and your naturalist guides have extensive knowledge of flora, fauna, history of the area and aboriginal culture, which will ensure you day will be a memory of a lifetime. Spectacular views where the world heritage rainforest meets the Great Barrier Reef - recently named the BEST drive in the world! Enjoy an Aussie BBQ lunch. Drinks at passenger's own expense. Billy Tea Safaris will provide Baby Seats or Booster Seat please advise upon booking, all children up to the age of 7 years. Please be aware there is a 24-hour cancellation policy of 100% cancellation fee. No exceptions. If you fail to load there is also a 100% cancellation fee applies. No exceptions. Please check our Terms and Conditions for Cancellation Fees. PRIVATE CHARTER RATES ARE AVAILABLE ON REQUEST. Your Daintree Cape Tribulation 4WD Bloomfield Track day tour begins with being met by your friendly accredited guide at your accommodation Cairns CBD area from 6.50am – 7.15am, Northern Beaches from 7.20am and Port Douglas area from 8.20am, and after introductions, we drive north along the magnificent scenic coastal route along the Captain Cook Highway learning about the history of the area and admiring spectacular views of the coastline and the Azure waters of the Coral Sea. Our first stop is at the Majestic Daintree River for Morning Tea (Tea, Coffee & Biscuits) before enjoying an informative guided River Cruise on the Daintree River. Relax and enjoy the splendour only the Daintree can offer as you learn of Estuarine Crocodiles, mangrove forests and endemic wildlife, this is nature at its best! From here we make our way up over the Alexandra Range and pause for a panoramic view of World Heritage, Wet Tropics, and Tropical Rainforest merging with the azure colours of the Coral Sea. Experience the rainforest intimately on one of our guided elevated National Park Boardwalks. Your experienced guide will take you on a wonderful journey through this ancient rainforest whilst giving you interpretation of flora and fauna and you will have ample time for photographs and questions as we search for the elusive, rare and totally unique Southern Cassowary and other wildlife species within this particular habitat. We now make our way towards Daintree, Cape Tribulation and stop for lunch at a restaurant, which is also an animal refuge centre where you have the opportunity to hand feed the wallabies, get up close to Eclectus Parrots, Pythons & other native wildlife enjoy delicious barbecue lunch with freshly prepared salads in a beautiful rainforest setting restaurant, (we also cater for vegetarians and other dietary requirements upon notification before tour day) enjoy a cold drink from the bar (own cost). Our tour does a little more. It takes us beyond the famous Daintree Tea Plantation, past spectacular mountains and through spectacular World Heritage Rainforest as we pass Cape Tribulation and continue along the 4WD Bloomfield Track through to pristine Emmagen Creek. Billy Tea Safaris is the only tour operator that goes to this secret Jewel in the Rainforest, and now it is time for a refreshing rainforest stream swim, in crystal clear fresh waters and without the crowds of people. As you seek fish and turtles in this wonderful Rainforest creek, butterflies and exotic birds in the trees and indulge in a feast of exotic tropical fruits, and enjoy sample a cup of traditional Billy Tea, made in a traditional Australian Billy, all of which enhance the tranquil surroundings. You can also enjoy a wonderful refreshing fresh water swim here in crystal clear waters. We stop at Daintree’s hidden secret, the Daintree Ice Cream Company. Your taste buds will be tantalised with exotic tropical fruit home made ice cream. Sample unique flavours, such as Black Sapote, Soursop, Wattle Seed, Jackfruit, and Coconut just to name a few. All the fruits used to make the ice cream have been locally grown on the property and can be purchased at your own expense. This is cash only no eft-pos. After a short afternoon refreshment stop, we cross the Daintree River by cable ferry and begin our homeward journey somewhat wiser for our 'Total Rainforest Experience'. Arriving back at your hotel accommodation approx Port Douglas 5.30pm, Northern Beaches approx 6.00pm, Cairns CBD Area approx 6.30pm. Great package deals are available at this site. This is a wonderful time of year to see the Daintree, Cape Tribulation and 4WD Bloomfield Track, with the turquise blue waters of the Coral Sea against the wonderful World Heritage Rainforest makes for an amazing photo. With Cassowaries and Chicks seen regularly on our guided walks and also the sightings of Boyd's Forest Dragons and the arrival of the Buff Breasted Paradise Kingfisher from New Guinea makes for a wonderful tour. After all the heavy rain early in the week and the Captain Cook Highway being closed at Buchans Point, just north of Cairns, we are now back and operating as of 22nd March, we are getting all the way through to Emmagen Creek north of Cape Tribulation with our high clearance 4WD vehicles and not having any problems. We are seeing lots of crocodiles, pythons, on the Daintree River Cruise and we are seeing a resident Male Cassowary and chick on our guided board walk. Looking for something to do come and join us. This past week, has seen a lot of cassowaries around especially with new chicks. These cassowaries have been seen regularly. Also there are crocodiles been active on the river as it is coming into there breeding season. Even though Cairns and surrounding areas have received some heavy rain, it is nothing out of the ordinary for this time of year which is coming up to the start of the wet season. Yesterday on our Daintree Cape Tribulation tour we had a few showers then it cleared as we got up into the Cape Tribulation area, despite being the wettest place in Australia with an average rainfall of 5 - 6 meters. On the river cruise we saw 4 crocodiles out and about foraging for their breakfast, a few green tree snakes and a Great Billed Heron which is a usually very shy rare bird to see on the river, alot of the trees are in fruit, so this is providing ample food for the many different species of birds and wildlife. On our board walk at Jindalba we saw a female cassowary and also spotted the Buff Breasted Paradise Kingfisher which is a rare migratory bird from Papua New Guinea. These amazing birds wait for the start of the wet to then start their migration to this area to nest and rare their young before heading back to New Guinea on their epic journey. So don't let a little bit of rain bother you come and see the amazing wildlife and all the waterfalls that are running. Billy Tea Safaris also have high clearance 4WD vehicles to allow us to get to these areas despite the weather. The forecast is the weather is clearing by Friday. This male cassowary was out and about foraging for food, and we were lucky enough to see it yesterday. There have been several sighting in the past few weeks. The Southern Cassowary (Casuarius Casuarius) is the largest flightless bird in Australia and is on the endangered list, as numbers have depleted dramatically in the past 10 years through Natural Diasters and Ferral animals. The male also takes on the role of raising the chicks, once the female has laid the clutch of eggs, the female leaves and has nothing todo with the eggs or chicks once they are hatch. The male will sit on the eggs for a period of 47 - 54 days before they hatch, he will then care for the chicks until they are about 2 years of age before leaving them to fend for themselves. 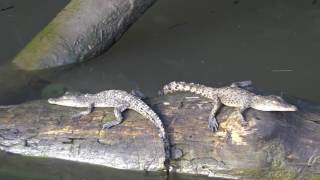 This past week as the temperature warms up the Crocodiles on the Daintree River are becoming more active in searching for a mate as it is coming up to their breeding season, and regular sightings of many crocodiles both large and small have been seen. Our passengers have been treated to a regular sighting of a large male cassowary with two chicks, this is a spectacular sight. "Jackie" is now staring on You Tube. "Jackie" is a Red Kangaroo who delivers Mail and News for the locals who live in Cow Bay. With Billy Tea Safaris you can see and meet "Jackie" on our Daintree Cape Tribulation 4WD Bloomfield Track Tour as we visit here everyday to have our delicious BBQ Lunch. Want to know more than take a look at the latest You Tube Video. Billy Tea Safaris Cape Tribulation one day tour ventures up to Emmagen Creek daily, which is 14km up the 4WD Bloomfield Track. Guests enjoy a swimming in the beautiful pristine crystal clear waters of Emmagen Creek, in the Heart of World Heritage Rainforest. This is a secret jewel in the rainforest that even most locals don't know about. While there, enjoy a demonstration of boiling traditional Billy Tea, washed down with home cooked Australian damper, and locally grown exotic tropical fruits. A real Aussie Experience. It is not uncommon to see Cassowaries and Boyd's Forest Dragon throughout the day as well as the popular Salt Water Crocodiles on the Daintree River Cruise. Over the past few weeks, we have had regular sightings of Male Cassowarys on our guided boardwalk tour. Join us on tour and you to may have a chance of seeing these beautiful rare birds. Over from the UK and had Fin as our guide on the 7/01/2018. Happy to say it was bar far the most enjoyable and engaging trip I have ever been on. The Rainforest was stunning but the day was made by the guide and his enthusiasm. 10 out of 10 and would happily encourage others to partake. Thanks Billy tea! Billy Tea Safaris was amazing! I never got bored and learnt so much about Daintree and Cape Tribulation, EmJay was our guide and she was awesome! Never a dull moment on this tour, we saw 5 crocs 2 Papua frog mouths a king fisher and much more! I recommend this tour for people that wanna learn about where the oldest rainforest in the world meets the Great Barrier Reef! Thank you Finlay for such an exceptional tour yesterday through the Daintree & Cape Tribulation. Lunch was amazing and perfectly cooked steak. My cousins from Spain enjoyed themselves immensely and we were all grateful at how knowledgeable you were about everything. Of course our highlights of the day seeing the Cassowary crossing the creek and the amount of crocodiles we got see, finishing with feeding the Wallabies. Again thank you so much for sharing this special part of the world with us.